Food to cherish. Great taste 2017. A versatile ingredient, perfect with a wide range of dishes from breakfast to fine dinning. 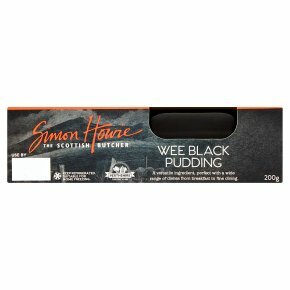 We've added a modern twist to our traditional black pudding recipe with caramelised apple and spices for a sweeter taste and a softer texture. The pudding is easily sliced to your desired thickness and perfectly placed in a variety of dishes from breakfast to fine dining. Cut into approximately 10 slices. Remove outer casing before cooking.If cooking thicker slices adjust time accordingly. Ensure food is piping hot throughout. As all appliances may vary, these guidelines only. This product must cooked before eating. Preheat grill to moderate heat. Lay slices of the black pudding onto a suitable tray and then cook under the grill. (Do not place directly under the heat source, allow approx. 10cm space). Grill for approximately 4-5 minutes, turning occasionally. Lightly oil a pan and bring to a medium heat, for 4-5 minutes, turning frequently.